Good news for cartoon lovers! Animation International (AI) India has acquired the licensing and merchandising (L&M) rights of leading pre-school and home-grown IP, Purple Turtle. Purple Turtle is now officially available for licensing and merchandising. Animation International, one of the most renowned and respected names in content licensing and syndication industry across Asia, has been active for the last five decades. Being the pioneers, AI India launched some of the most credible IP’s in India including Hello Kitty, Marvel, WWE, Dragon Ball Z, Barney and Friends among others. Last year, AI organised the first Doraemon Licensee Expo in Mumbai on 3 August 2018. With an array of products ranging from chocolates to watches, plush toys, to feeding bottles, Doraemon is a popular toon companion for kids. 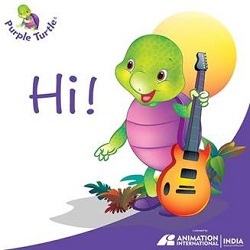 Purple Turtle is India’s first International brand with its educational content in 30 countries including Russia, China, US, UK and multiple languages in India. Purple Turtle was created to promptly spread education through a wide range of innovative children books and convenient online learning experiences bringing learning and entertainment on a common platform. ← The latest ‘Avengers: Endgame’ teaser is here!